How is your Summer vocation, kids? and Parents? Many of us parents have some camps or travels with kids, and have super fun, but parents need back to work, and there are 6 more weeks ahead, what fun you can have for your kids. Weather you have watermelon party, or camping night out, you are trying every bit to make your kids Summer a blast!! We just had a trip in the sizzling Sun for weeks, but hide out in the deep mountain to beat the heat Summer heat. 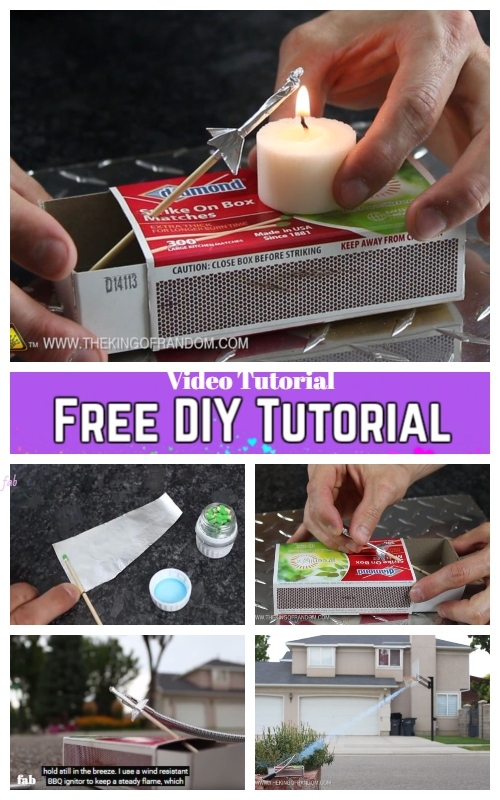 If you are on the lookout for a new DIY project that will bring you hours of fun at Summer night, then you will love this homemade rockets that shoot over 40 feet, with aluminum foil and a match. This ingenious video will show you exactly how to make a matchbox rocket kit and it is much easier than it sounds! All you’ll need is some matches, some bamboo skewers, tin foil, cardboard and some metallic tape. With a few quick twists, folds and snips, you too could have your own rocket-firing matchstick box and hours of fun at your disposal. Watch the video to find out how to make your very own matchstick rocket. The link on the video comes with links to all the templates, so all you need to do is print them out and there is minimal measuring involved so you won’t have to deal with fiddly measurements in order to perfect your design! WARNING: Although these rockets are only fueled by one match head, they do get hot enough to burn fingers, and leave scorch marks in carpets. This project should not be attempted without adult supervision, and if done indoors, safety precautions should be in place to mitigate any fire hazards. Misuse, or careless use, may result in property damage. Use of this video content is at your own risk.